BACKGROUND AND AIMS: The arterial wall calcium score and circulating free DNA levels are now used in clinical practice as biomarkers of cardiovascular risk. Calcium phosphate apatite retention in the arterial wall necessitates precipitation on an anionic platform. Here, we explore the role of tissue-free DNA as such a platform. METHODS: The first step consisted of histological observation of samples from human and rat calcified arteries. Various stains were used to evaluate colocalization of free DNA with calcified tissue (alizarin red, fluorescent Hoechst, DNA immunostaining and TUNEL assay). Sections were treated by EDTA to reveal calcification background. Secondly, a rat model of vascular calcifications induced by intra-aortic infusions of free DNA and elastase + free DNA was developed. Rat aortas underwent a micro-CT for calcium score calculation at 3 weeks. 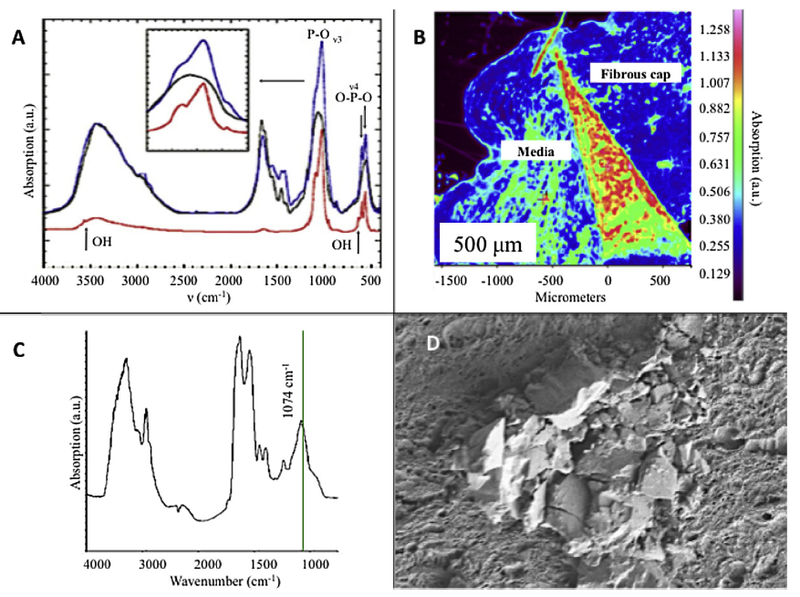 Rat and human calcifications were qualitatively characterized using muFourier Transform Infrared Spectroscopy (muFTIR) and Field Emission-Scanning Electron Microscopy (FE-SEM). RESULTS: Our histological study shows colocalization of calcified arterial plaques with free DNA. In the intra-aortic infusion model, free DNA was able to penetrate into the arterial wall and induce calcifications whereas no microscopic calcification was seen in control aortas. The calcification score in the elastase + free DNA group was significantly higher than in the control groups. Qualitative evaluation with muFTIR and FE-SEM demonstrated typical calcium phosphate retention in human and rat arterial specimens. CONCLUSIONS: This translational study demonstrates that free DNA could be involved in arterial calcification formation by precipitating calcium phosphate apatite crystals in the vessel wall.